389 Marlborough is located on the north side of Marlborough, between Hereford and Massachusetts Avenue, with 387 Marlborough to the east and 391 Marlborough to the west. 389 Marlborough was designed by architect Obed F. Smith and built in 1880-1881 by Vinal & Dodge, masons, and G. & E. Stewart, carpenters, for building contractor George Wheatland, Jr., for speculative sale. It was one of six contiguous houses (381-383-385-387-389-391 Marlborough) built at the same time and one of twelve contiguous houses (369-371-373-375-377-379-381-383-385-387-389-391 Marlborough) built for George Wheatland, Jr., in 1879-1881. He is shown as the owner of 381-391 Marlborough on the original building permit application for the six houses, dated November 11, 1880 (one application for six houses). The twelve houses were built in three groups: three at 369-371-373 Marlborough in 1879-1880, three at 375-377-379 Marlborough in 1880, and six at 381-383-385-387-389-391 Marlborough in 1880-1881. The six at 369-379 Marlborough are of the same design, and the six at 381-391 Marlborough also are of the same design as each other and quite similar to the six at 369-379 Marlborough. George Wheatland, Jr., purchased the land for the twelve houses at 369-391 Marlborough through two transactions. He purchased the eastern 200 feet on May 10, 1872, from Daniel Davies, part of a larger parcel Daniel Davies had purchased from the Boston Water Power Company on June 12, 1868. George Wheatland, Jr., subsequently transferred two-thirds interest to William Dudley Pickman and William Pickering Fay under a trust agreement and the remaining one-third to his father, George Wheatland, Sr., of Salem. The land remained vacant for the next seven years. On October 9, 1879, George Wheatland, Jr., purchased the land to the west, with a 80.58 foot frontage, from Grenville T. W. Braman, and subsequently transferred the lot to his father. The 80.58 foot parcel originally had been intersected by Parker Street, a 60 foot wide street located on top of the Cross Dam, which ran southwest from Beacon at approximately a 45 degree angle, intersecting the north side of Marlborough at a point about 355 feet west of Hereford. Grenville Braman had purchased the eastern portion of the lot from Daniel Davies on October 1, 1872, a triangular lot bounded on the west by Parker Street. In the late 1870s, Parker Street was abandoned and, through a series of transactions, Grenville Braman purchased the land under the roadway, another triangular parcel which he combined with the first to create the rectangular lot he then sold to George Wheatland, Jr.
George Wheatland, Jr., subsequently built the twelve houses at 369-391 Marlborough on 276 feet of the combined 280.58 foot parcel (the 4 feet to the east and the 0.58 feet to the west were sold by his father to others). The houses at 385-387-389-391 Marlborough were partially built on land that previously had been Parker Street, with the Cross Dam below. Click here for an index to the deeds for 389 Marlborough, and click here for further information on the land on the north side of Marlborough between Hereford and Massachusetts Avenue. As the houses were completed, William D. Pickman and the estate of William P. Fay (who had died in March of 1879) transferred their two-thirds interest to George Wheatland, Sr. He subsequently sold the houses to individual purchasers. On June 1, 1882, 389 Marlborough was purchased from George Wheatland, Sr., by Miss Augusta Magee Brown. She previously had lived in Brookline. Her sister, Hannah Louisa Brown, an artist, lived with her at 389 Marlborough. Hannah Louisa Brown died in August of 1894. Augusta Brown continued to live at 389 Marlborough until her death in March of 1916. In her will, Augusta Brown left 389 Marlborough to her first cousin, Miss Sarah Louisa Huntington of Salem, Massachusetts, the daughter of Asahel Huntington and Caroline Louisa (DuBlois) Tucker Huntington (Caroline (DuBlois) Huntington was the sister of Augusta Brown’s mother, Sally Williams (DuBlois) Brown, the wife of John Clark Brown). By the 1916-1917 winter season, 389 Marlborough was the home of John H. Thomas and his wife, Margaret (Hale) Thomas. They had married in January of 1916 and probably had first lived briefly at 336 Marlborough (where he had lived before their marriage). John Thomas was manager of the Boston office of the White Star steamship line. They continued to live at 389 Marlborough during the 1917-1918 season, but moved thereafter to New York City. By the 1918-1919 winter season, 389 Marlborough was the home of Laurence Willcomb Morgan and his wife, Esther Parkman (Turner) Morgan. In 1917, they had lived in Beverly Farms. He was a salesman of fuel oil burners and later a trustee. 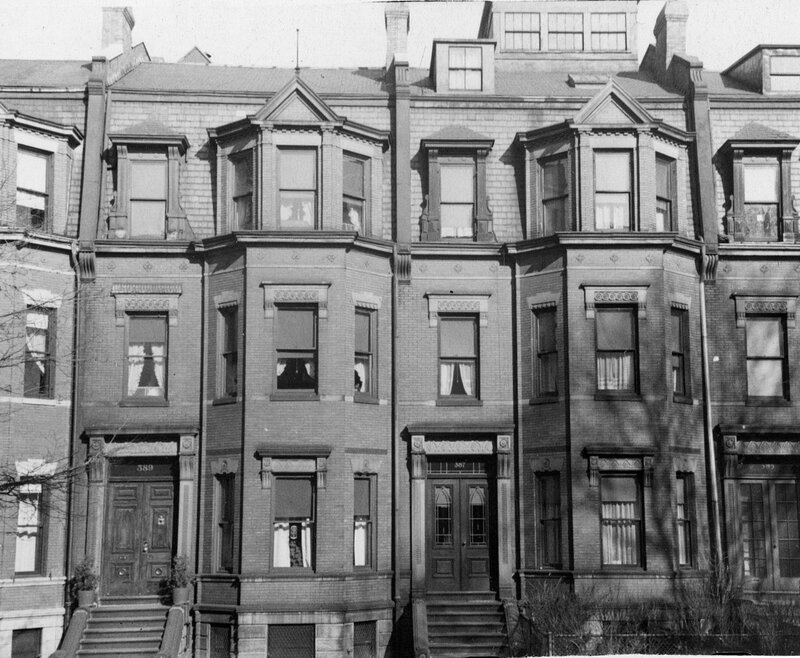 They continued to live at 389 Marlborough during the 1923-1924 winter season, but moved thereafter to 387 Commonwealth. In 1924, 389 Marlborough was the home of Edward Preble Motley, Jr., and his wife, Dorottya (Fremont-Smith) Motley. He was president of the Massachusetts Box Company. Their primary residence was in Beverly. On October 31, 1924, 389 Marlborough was acquired from Sarah Huntington by Miss Mary H. Horgan and her sister, Anna Bertha (called Bertha) Horgan. Their brother, Frank T. Horgan, a banker, lived with them. Frank Horgan married in 1925 to Julia Mallon. 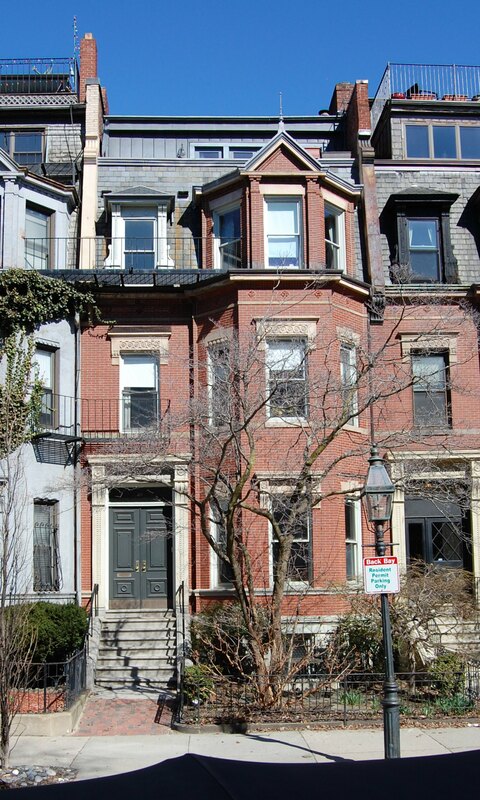 After their marriage, they lived at 389 Marlborough with his sisters. 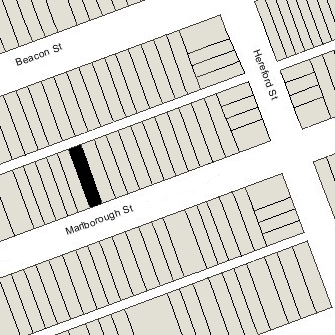 On June 7, 1933, Bertha Horgan transferred her interest in 389 Marlborough to Mary Horgan. By the late 1930s, Frank and Julia Horgan had separated. He continued to live with his sisters at 389 Marlborough, and she moved to 74 Park. By 1940, the Horgans also accepted lodgers at 389 Marlborough. Mary Horgan died in March of 1942. On July 8, 1943, Lucinda Constantine, trustee under Mary Horgan’s will, transferred 389 Marlborough to Bertha Horgan. Frank Horgan died in 1949, and Bertha Horgan moved thereafter, probably to Brookline where she was living at the time of her death in 1956. On October 21, 1949, Bertha Horgan transferred 389 Marlborough back to Lucinda Constantine, as trustee under Mary Horgan’s will. That same day, 389 Marlborough was acquired from Lucinda Constantine by Louise Marie (Gautreau) Geldart Brideau, the wife of Bernard Brideau, who operated it as a lodging house. They previously had lived at 86 St. Stephen. They continued to live at 389 Marlborough in 1954, but had moved to 332 Commonwealth by 1955. On December 8, 1954, 389 Marlborough was acquired from Louise Brideau by Avard Cummings Sproul and his wife, Kathryn Ashton (Gibbs) Sproul, who operated it as a lodging house. They previously had lived in New York. They continued to live at 389 Marlborough until mid-1956, when they moved to 351 Marlborough. On March 2, 1956, 389 Marlborough was acquired from the Sprouls by Martha G. (Janil) Papazian, the widow of Kapriel Serope Papazian. She previously had lived in Watertown, where her husband had been a life insurance broker and also was an author and newspaper editor; he had died in May of 1949. In May of 1957, 289 Marlborough was acquired from Martha Papazian by Trygve Hilmar Stensrud, a former steamship officer, and his wife, Emily Elizabeth (Garvey) Stensrud. In April of 1963, the Stensruds applied for permission to build a new dormer on the front of the building. They subsequently abandoned the application. In the application, they had indicated that the current legal occupancy was eight apartments. However, they continued to operate the property as a lodging house until the mid-1970s. On November 22, 1978, 389 Marlborough was purchased from the Stensruds by R. Sarah Compton. On September 24, 1979, 389 Marlborough was purchased from R. Sarah Compton by Harry K. Oppenheim and his wife, Linda Kay Smith. In October of 1979, Harry Oppenheim applied for (and subsequently received) permission to convert the property from eight apartments into two apartments. The property subsequently changed hands. It remained a two-family dwelling in 2017.